Can you believe LAST Monday was my birthday and I didn’t even post one single birthday related thing?!? Don’t worry… I’m about to make up for it. I’ve got a few great birthday recipes lined up this week. All happen to be cake batter themed… not my first choice, but oh so yummy! 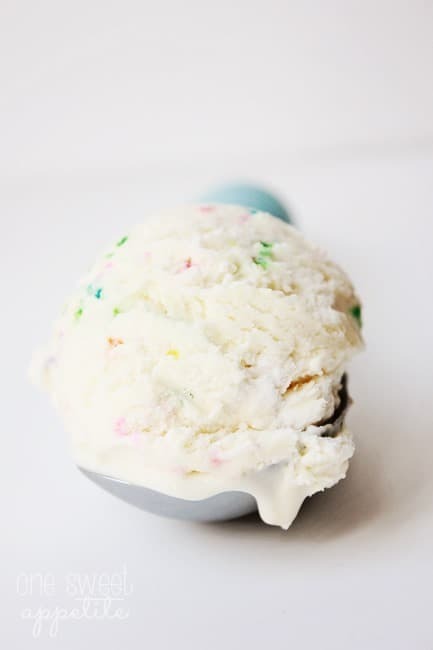 I started with a simple two ingredient ice cream and added some extra special ingredients. You will n ever believe how fluffy and amazing this ice cream is. It takes an entire 10 minutes to whip up and there is NO machine required! Stir the milk, cake mix, and vanilla in a large bowl. Set aside. Whip the heavy cream until soft peeks form. Gently fold into the milk mixture. Pour into a large air tight container. 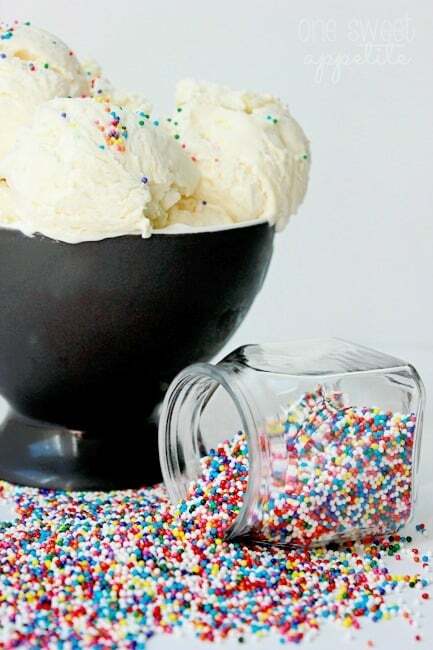 If you want to add sprinkles… sprinkle across the top and gently stir in with a knife. 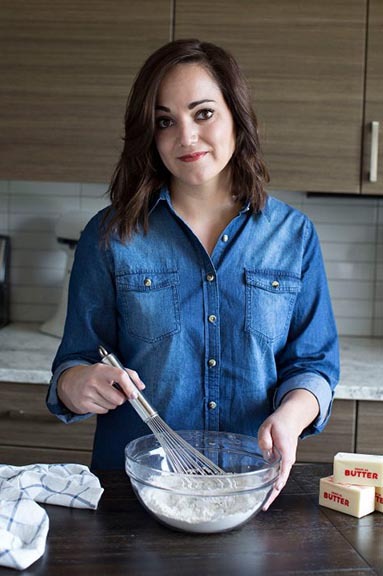 Cake or ice cream is never my first choice, but since I have the pleasure of hanging out with my beautiful niece the next few weeks I made an exception and created this recipe just for her. Cake batter is her favorite ice cream flavor OF ALL TIME, so I knew this would be an instant hit! I’m going to take this time to announce a fun little treat that will be happening here in August! I am hosting an ice cream social of sorts. 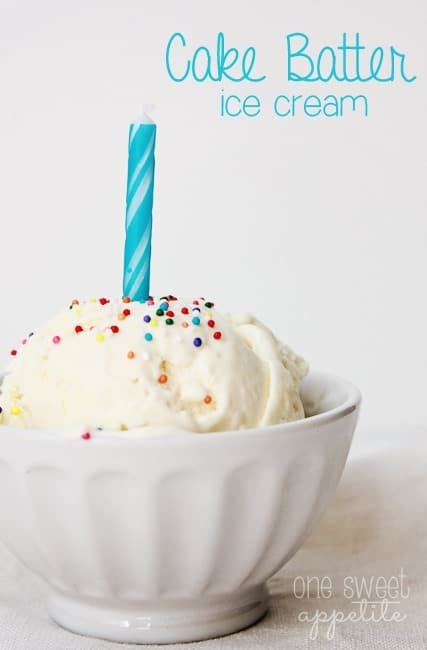 There will be 30 days of ice cream recipes right here on One Sweet Appetite! 30 DAYS!!! Talk about ice cream overload! There will be ice cream recipes, sandwiches, floats, popsicles. Most from yours truly, but a few recipes from OTHER amazing bloggers! I am so excited and can’t wait for you to see what we have coming your way! Stay tuned! What a fun series this will be and what a perfect time of year! You always have the best ideas for series 🙂 Can’t wait to come back each day and check it out! So easy! My kids will love helping make this!! My daughter would love this – looks yummy! This one looks so amazing! And so simple too. I can’t wait to try it. And I cant wait to contribute to your ice cream month! I am so excited to try this one! Looks delicious! And no machine…how easy! I love cake batter flavor. I need to try this. Sounds so simple! I just came from Mrs. Diner’s Food Holiday Link Party for Ice cream this week. This recipe sounds delicious, I know my grandsons will enjoy it. It’s been so hot I think it will be a nice treat for the holiday. Yum, this ice cream looks delicious. I found your blog on Whatever goes Wednesday, I’m subscribing! Oh my goodness – this looks so good! I’m definitely trying this. Pinning! I’ve got an ice cream maker though – I assume the recipe will work just fine in it? Thanks!